In my previous article Introduction to Web Services we learned how to create a simple Web Service. This article explains how to consume the Web Service in an ASP.Net web Application. And remember, I have written this article only focusing on beginners. So let us start step-by-step so beginners can understand it very easily. You need to keep a Web Service application in running mode so it can be accessible for use, so go to my article Introduction to Web Services and create a Web Service and keep it in running mode I hope you have done that. Many beginners are confused about what means consuming means, but its very simple, it means to use the Web Services in an application. 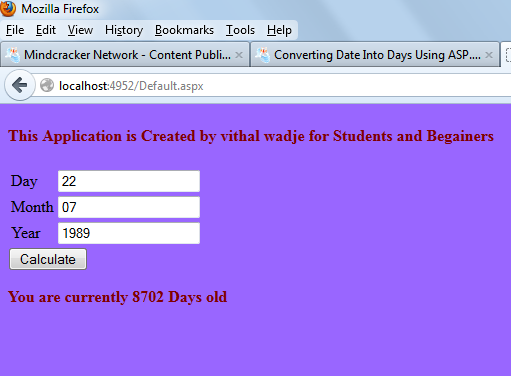 I have created Web Services and now I want to use it in a real requirement so I used it in an ASP.Net Web Application. 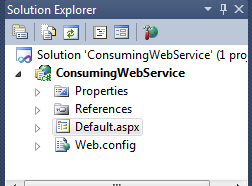 In other words, I am consuming the Web Service in an ASP.Net web application. Similarly you can use the same Web Service in Windows, console application, Java and other applications. I hope you understand the word "consuming". "File" - "New" - "Project..." then in the New Project window "C#" - "Empty Project" (to avoid adding a master page). Give the project a name, such as "Consumingwebservice" or another as you wish and specify the location. Then right-click on Solution Explorer and select "Add New Item" - "Default.aspx" page. Then drag three Text Boxes, one Button, and one Label onto the "Default.aspx" page. In the preceding source code, you have seen that I have taken three text boxes to get input from users because we know that our Web Service method created as in my article Introduction to Web Services takes the three input values day, month and year so I have taken the three text boxes and button click event. We will call the Web Service method and the output will be displayed on the label control so I have also taken one button and label control. 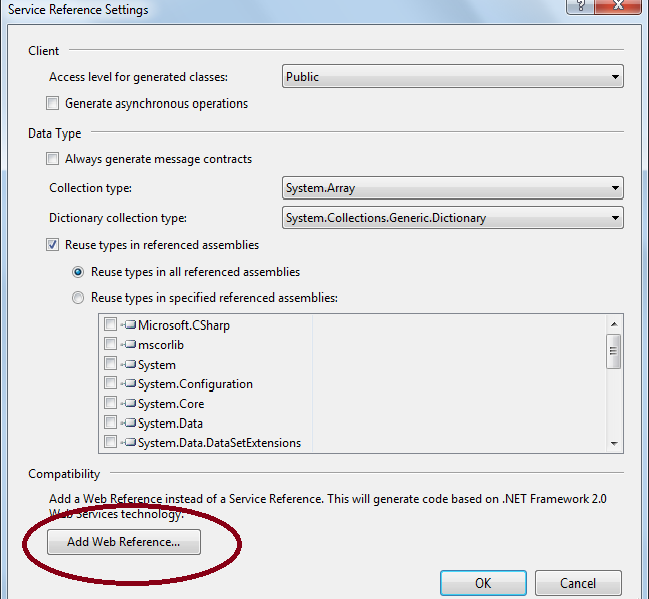 The most important task whem consuming a Web Service in an ASP.Net Web Application is adding the Web Service reference into the ASP.Net web application. So how to add it? Let us see the procedure. 2. Then after clicking on the above option, the following window will appear, then click on the "Advanced" tab. 4. After clicking on the Add Web Reference tab, it will show the following window. 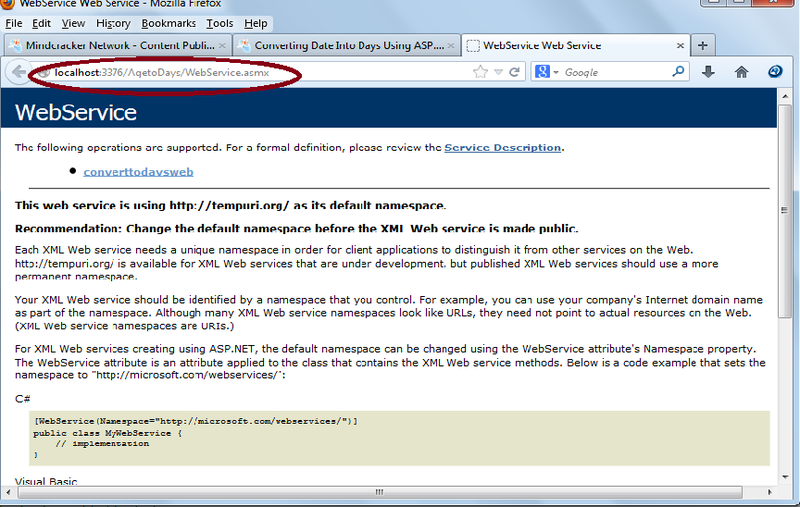 Now this is a very important step, when adding the web reference to the ASP.Net web Application. Since you see "URL" option in the following window, on that window we need to paste or type the Web Service URL address. 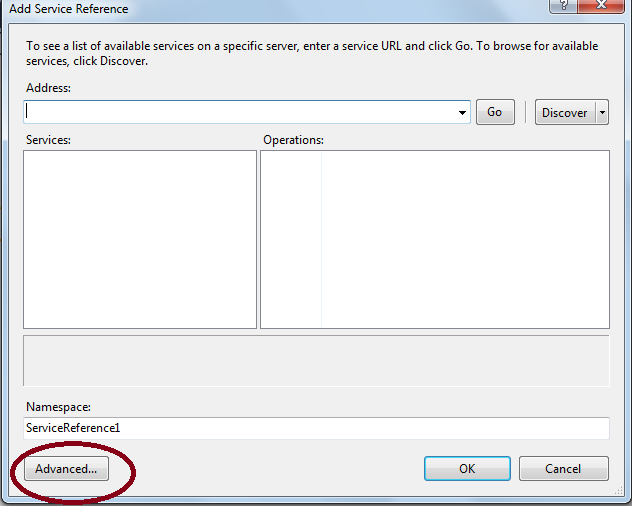 So how to add the URL Reference in the preceding URL box, let us see the procedure again. Run the Web Service we created in my article Introduction toWeb Service with Example in ASP.Net by clicking on F5 or whatever other option you are familiar with, it will then show the following web page. 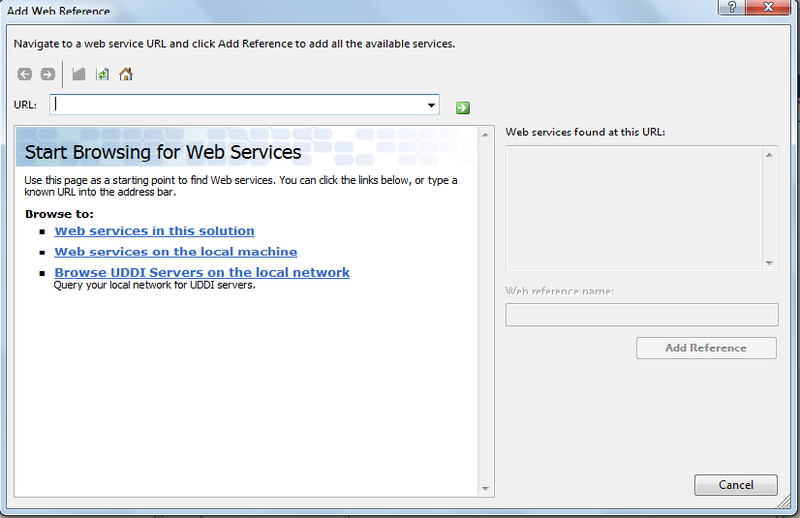 After pasting the URL in the preceding window box, click on the green right headed arrow button, it will discover the Web Services available related to that URL address and you see that in that related URL one Web Service is found message is displayed along with the Web Service name, "Web Services" in the preceding right hand side window. The Name of the Web Service is "WebService" because I have given the class name as Web Service, that's why the name is Web Services, in your case it might be different or the class name is anything so you can use any name for Web Service so don't be confused about it. In the right hand corner of the window you have seen the option for the Web reference name; the web reference name is anything you wish and this name will be added in your ASP.Net Web Application as allies name for Web Service. In my article I have given the web reference name as "local host". 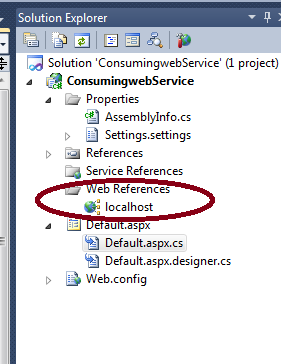 In the preceding window, you have clearly seen that the Web Service reference named "localhost" is added into the ASP.Net web Application. 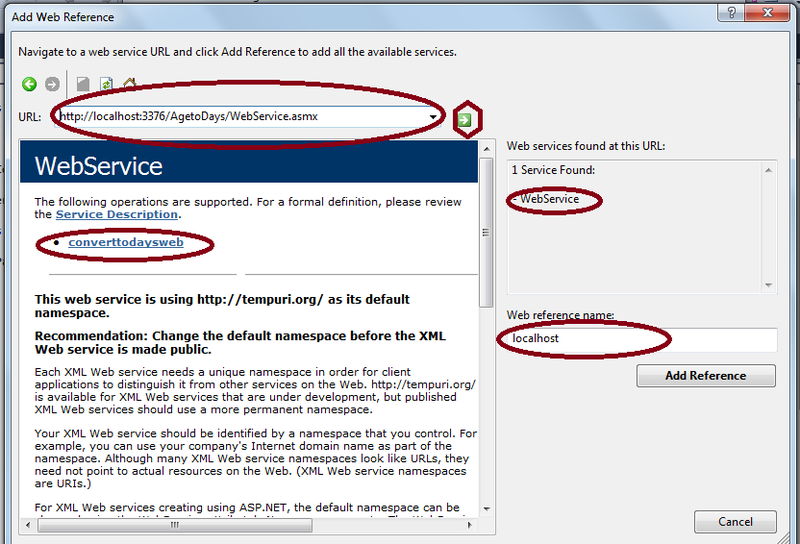 I hope you understand how to add the Web Service reference into the ASP.Net web application. We have added the Web Service reference into our web application. Now next is how to call the Web Service method that we created in our Web Service Application from the ASP.Net Web Application. 1. Go to the Default.aspx page of our ASP.Net Web application and double-click on the button that we have placed on the Default.aspx page. 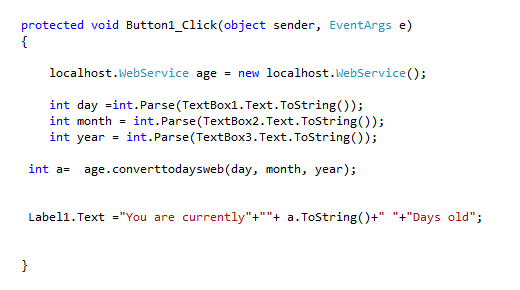 In the code above, I have created the object of Web Service class named "age" followed by the Web reference name ("localhost") and Web Service class ("webservice"), I hope you understand how to create the object of the Web Service class. In the code above, I first created the object of the Web Service class named "age" followed by Web reference name ("localhost") and Web Service class ("webservice"). Then I declared the three integer variables "day", "month" and "year" to store the values provided by the user as input from the Textbox1, Textbox2 and Textbox3. Now, in the next step, as you know our new Web Service method takes three parameters, so I passed the three input parameters "day", "month" and "year" to the Web Service method "converttodaysweb". Then I declared another integer variable, "a", to store the values returned by the Web Service method "converttodaysweb". And finally I displayed the values returned by the Web Service method "converttodaysweb" on the label control using variable "a" because, as you know, we have stored the returned values of the method into the variable a, so the final result will be stored in the variable a. In the preceding screen, you see that currently, I am 8702 days old, which means that for the last 8702 days, I have been on this earth. Also refer to my previous article about creating a Web Service. I hope that beginners as well as students understand the creation and consumption of Web Services in ASP.Net web applications using my two articles. If you have any suggestion regarding this articles then please contact me. Student suggestions are also welcomed.